Norland Norburn Lo-Ridge Log Cabin: The Norland Norburn Lo-Ridge Log Cabin has a classic log cabin design with a spacious front porch and single rectangular room. With its ridge height of 2.45m (with a roof angle of 10 degrees), the Norburn has a very tasteful appearance. The interior space is a generous 18.7m/sq, which can easily accommodate a sleeping space, sofa set, or dining set. With its two double windows and windowed double doors, the front of the cabin can let in plenty of natural light and fresh air whilst the porch cover provides shade during the summer months. With 70mm wall logs and double glazing, the cabin keeps a steady temperature and protects the interior from outside noise, creating a cozy and inviting sanctuary suitable for any outdoor space. 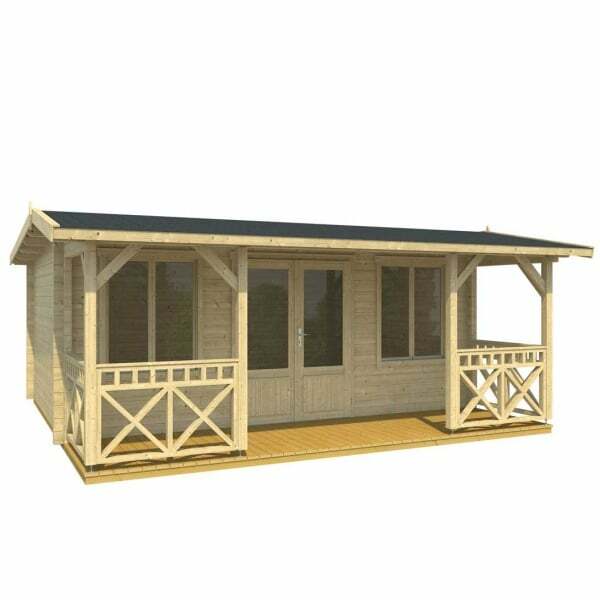 The Norland Norburn Lo-Ridge Log Cabin is easy to assemble and are an extremely sturdy structure as they are built in the traditional Log Cabin style and therefore uses no screws or nails in the wall construction. The Norland range also feature chalet corner jointing to give that extra timber jointing for extremely good weather resistance.